After Warsaw fell in 1942, it seemed that Poland was pretty much done for. They decided otherwise. We all know what the word “resistance” means, but Merriam-Webster’s secondary definition is also pretty much apropos. It is, “the capacity of a species or strain of microorganism to survive exposure to a toxic agent (as a drug) formerly effective against it.” We are the microorganisms – small and previously disorganized – who will survive the present toxicity. Poland’s resistance was successful because it involved virtually every member of society – men, women, children, from professionals to laborers and religious people. And, though it was shut away behind the Iron Curtain for fifty years, Poland’s resistant spirit reignited in the days of Solidarity under the leadership of Lech Wałęsa. Obviously, we need to eat some Polish food to fuel ourselves for the winter ahead. In another example of America’s melting-pot culinary tradition, many people from the South grew up eating cabbage rolls. T’s mother sometimes fixed them when she was growing up, but not frequently. Cabbage rolls are a lot of work, as we discovered. The nice thing about this recipe is that though some people add a couple of eggs to the filling, those can be left out with no terrible consequence. Ground chuck and pork is the original meat for the recipe, but it’s easy enough for the veg/ans to substitute a meat-analog in crumbled form, like Tofurky sausage and Quorn or Morning Star’s Griller crumbles. Avoiding all carbs? Leave out the rice and add chopped tomatoes. This is flexible comfort food, and can be as healthy as you like. 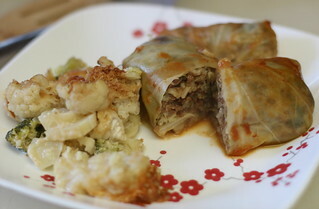 Cabbage rolls are pretty much a meal within themselves, though a traditional side is noodles in mushroom gravy, or boiled potatoes. We ate them with baked cauliflower, because some days one must double-down on the veg. Some Polish Americans eat cabbage rolls browned in butter, with a bit of sour cream, but they’re also perfectly reasonable as is. 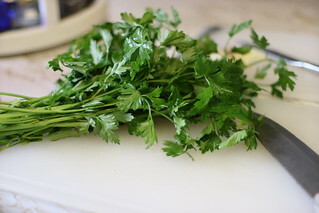 Don’t forget parsley; shredded carrot or tomatoes. 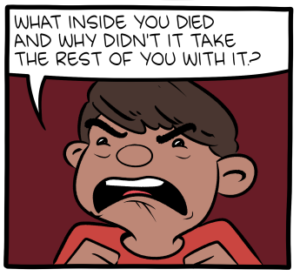 …and now it all gets just a bit messy! 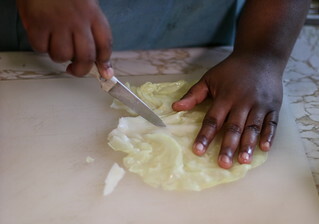 Cabbage Prep: With your newly whetted knife, with which your husband obviously intends to gut a cow, carefully core your cabbage from the bottom. Fill a large pot of water half-way and when it comes to a boil, put in your entire head of cabbage and let it boil. After about ten minutes, we fished out our cabbage head, leaving the water hot in case the core wasn’t quite soft enough, and gently begin to peel apart the leaves when it was slightly cooled. We made a pile of “reasonable to use” and “others” and set them aside. Some people prep the cabbage leaves by thinning the thick spine with a paring knife, and making a slit along it to make rolling easier. 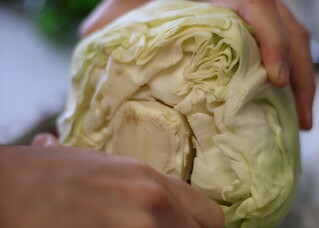 Be careful that the slit is only an inch long; cabbage leaves can be delicate. 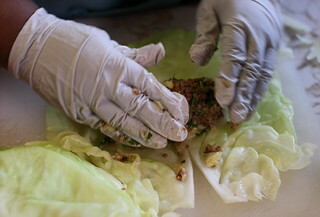 Rice Prep: While the cabbage is boiling, prepare rice according to package instructions, BUT, only boil for ten minutes. Drain, rinse in cold water, and set aside. Brown Veggies: In your butter or oil, brown the chopped onion for about three minutes. Add mushrooms and garlic and turn off the heat, continuing to stir so it doesn’t burn. Stir in paprika and black pepper. 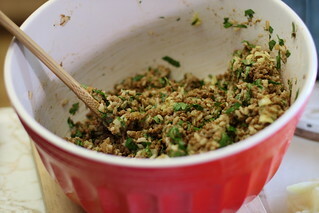 Roll ’em: In a mixing bowl, combine rice, meat, parsley, and your onion and spices mixture. Don’t forget your salt. This stage is a lot like making meat loaf, and most people advise you to use your hands. 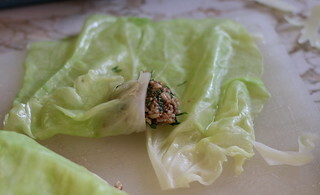 Using an ice cream scoop, scoop about a quarter cup of filling per cabbage leaf, cross the little triangles formed by the slit toward the stem end, fold over the sides, and roll them. Place them in a pan seam-side down. You will need 3/4 c. of some kind of liquid to complete cooking the rice inside of the rolls, and to allow the rolls to plump. The two tablespoons of tomato paste will dissolve well in water or broth to fill that need. Some people just pour a little V8 in the pan, but cabbage is a watery vegetable that needs intense flavor, so don’t be afraid to add some. NB: If you’re not using meat, cook these rolls for 45 minutes. If you’re using meat, 1.5 hours is your baking time. Meat eaters, let your rolls rest for the same half hour you would a steak. 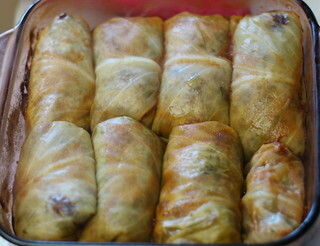 Conventional wisdom is that cabbage rolls are better the next day, and they also freeze very well. And they’re good for you. John Stuart Mill, in an address at the University of St. Andrews in 1867 said, “Bad men need nothing more to compass their ends than that good men should look on and do nothing.” While you may be uncomfortable with the labels of “bad” and “good” here, the point is to do something. Eat well. Sleep well. Do well. You are not defeated, not by winter cold nor war nor work nor worry. Decide otherwise.